Contractors for the North Dakota Department of Transportation (NDDOT) Fargo District and City of Fargo 10th Street North road reconstruction and infrastructure improvement project will begin work on the 10th Street and 11th Avenue North intersection on Monday, July 30. 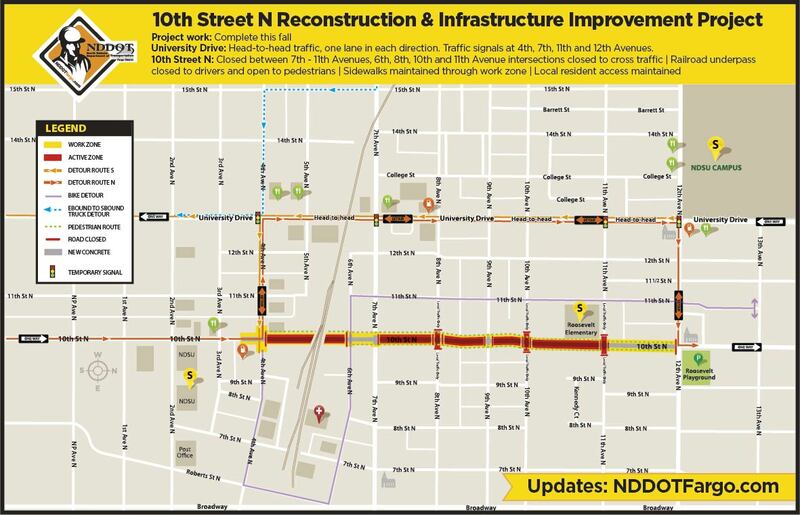 Next week crews will begin grading operations between 8th Avenue to 10th Avenue with paving operations between 8th Avenue to 10th Avenue North on the mainline of 10th Street N.
Project work will begin on the 10th Street and 11th Avenue North intersection on Monday, July 30. Two crews are working on the north and south blocks of the 10th Street N reconstruction project on underground utilities and improving the roadway surface. An additional crew continue work under the railroad underpass on the new lift station. As a reminder, this construction project is to replace aging infrastructure and continuing the city-wide effort to upgrade services for residents and businesses on 10th Street N from 4th Avenue N to 12th Avenue N. By the completion of the project in late fall, north Fargo drivers, residents and businesses will have new concrete driving surface, new curb and gutter, street lights, sidewalks, city utilities, new lift station and the installation of a 30” sanitary sewer force main throughout the project limits.